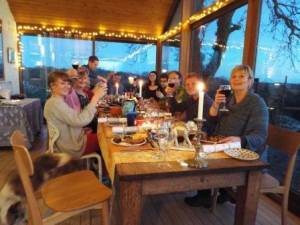 Christmas in Pembrokeshire – what a treat! Our self catering accommodation, Loveston Cottages and Hundleton Houses are once again full over this festive season, with family and friends coming together in the beautiful Pembrokeshire countryside and coast for some quality time and fresh air adventure. We love a Pembrokeshire Christmas and wanted to help get our guests into the festive spirit, so we put real Christmas trees in the houses. After all, it wouldn’t be Christmas without the glorious smell of pine needles sailing through the house. Paired with a toasty log fire and a glass of wine to go with our complimentary homemade cake, you could be forgiven for not wanting to leave! It is a Christmas Eve tradition for us to go to a neighboring farm to sing to the cows. It sounds a bit bonkers, but some farmers believe that it is good luck and will encourage a successful milking season. The weather was predictably chilly on Christmas day but that didn’t deter us from heading out for a walk to admire the breathtaking scenery surrounding us. 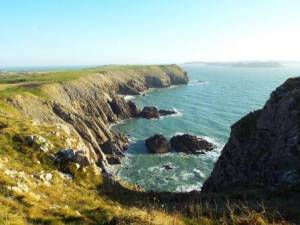 We started in Tenby on the famous Pembrokeshire coast path with our beautiful Collie, Yoko. 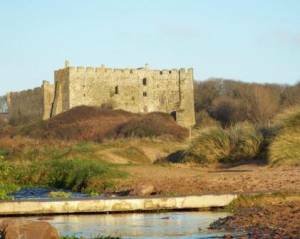 The end of our Christmas jaunt was marked with the majestic Manorbier Castle, standing proud ahead of us. There are plenty of castles in Pembrokeshire, each with their own great and gory history. Many offer tours and activities for kids too. Surfing is a very popular sport in Pembrokeshire, and if you don’t fancy it in the winter months (we don’t blame you), you can take lessons in the summer. It’s suitable for all ages and there are loads of great surf schools that we can recommend. Our guests staying in Sisters House, Hundleton went for a family walk up to Pembroke Castle, the birth place of King Henry VII and thoroughly enjoyed taking the scenery and history of the area. With the New Year mere days away, guests prepare for their own celebrations with family, friends and fireworks. Our character self catering accommodation books up fast for Christmas and New Year, so if you would like to stay with us next year and sample a slice of a wholesome Pembrokeshire Christmas, then please do get in touch.